Please note: There is a link error we’re trying to fix. If you are looking for the post on Keto Donut & Pastry Recipes from our sister site Kale and Kettlebells, head over to 11 Donut and Pastry Recipes for a Ketogenic Diet. We apologize for any inconvenience this may have caused. Keto cookies, chocolate cake, pastry, pizza. Within a week of starting a ketogenic diet, you realize just how powerful cravings can be. And just how much you need to find good ketogenic diet recipes for weight loss ASAP. But don’t give up on the ketogenic diet just yet. It’s completely normal to crave those carbs, especially when you are not used to eating gluten-free. Whether you would love some pancakes for a keto breakfast or just want easy keto diet dinner recipes, we’ve got your back. It’s time to venture into trying out lower carb alternatives for your favorite meals. The good news is that there are plenty of easy keto recipes that you can have when you are faced with those cravings. And be sure to check out 11 Donut and Pastry Recipes for a Ketogenic Diet too! So, without further ado, here are 15 delicious ketogenic diet recipes for people who love carbs. When in keto diet mode, there will come a time when you get that insatiable craving for hamburgers. But have no fear, this hamburger bun recipe might just be the best low carb bun ever. Check it out and save it for when the craving strikes (or you could make it today). I don’t know about you but I can eat banana bread any day. Here is a perfect paleo banana bread you will want to make this week. Now, chocolate chip cookies may not sound keto diet friendly, but it is if you make it right. Follow this recipe and you will be pleasantly surprised. You know when you really want a chocolate cake but can’t even be bothered getting all your baking gear out? This is a quick little treat for those times. I am personally obsessed with lasagna. If you are too, make this low carb lasagna, and you may not even feel like you’re on a diet. 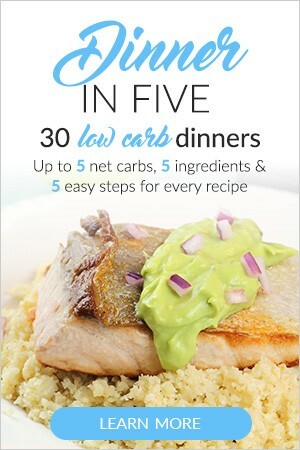 Try these 5-ingredient Low Carb Dinners for just $9.99 today. Pizza is a great way to break up the monotony of eating keto meals without actually ruining your low carb diet. This recipe includes shredded cheese, but you will find suggestions for gluten-free pizza base as well. Perfect for those who love a bit of spice and cheddar in their baked goods, these muffins will not disappoint. It’s okay to have scones once in a while especially if you use almond flour and make them like this. Forget carb-laden pizza rolls, try these instead. Here is another chocolate chip cookie recipe that’s low carb and extremely decadent. Have you ever noticed how a great curry makes even cauliflower rice taste amazing? If you haven’t tried it for yourself yet, here is a delicious coconut curry recipe by Keto Connect. Carrot cake is so good and it’s even better when it’s made into healthy bite-size portions. Make these tortillas and add all your favourite healthy low carb fillings to go with it. I’ve decided to include a couple of pancake recipes because us carb lovers can’t live without pancakes. Here is an easy 2-ingredient pancake recipe to try. Another take on cream cheese pancakes you will seriously want to try for yourself. And that’s the end of this roundup of 15 delicious ketogenic recipes for people who love carbs. Do you need a little more guidance on what to eat while on the keto diet? Or just want to see faster results? The Keto Beginning will help you do just that! The Keto Beginning is a beginner keto guide with a 30-day meal plan that will show you how to lose weight on the keto diet and reach your happiest healthiest weight – faster. Click here to get The Keto Beginning right now. Loved this roundup? Why not help someone else out by sharing it on Facebook, Twitter or Pinterest?